As you folks are obviously big fans of real estate and development (you are reading a blog dedicated to those things, after all), some of you may remember playing with K’Nex construction toys when you were younger – dreaming of one day becoming a big time developer. 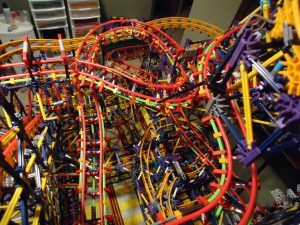 So here’s a question: Do any of you still play with K’Nex? Because reaching adulthood doesn’t necessarily mean you stopped – just look at University of Colorado engineering student Andrew Locke, who recently designed and built a working pinball machine entirely out of K’Nex parts. On his YouTube channel, Locke says he doesn’t know the exact number of pieces he used, but estimates it to be around 17,000. The craziest part is, he says the whole endeavor only took him about four months to complete!